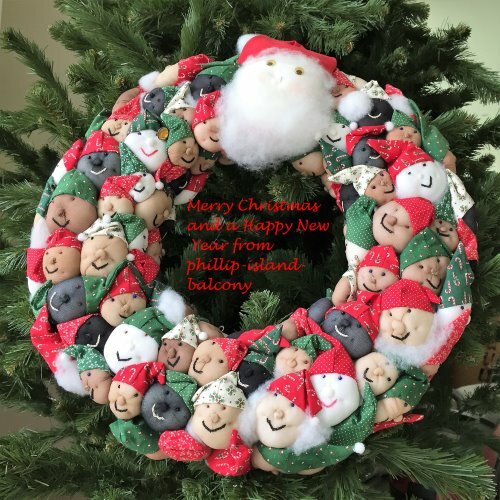 I wish all my subscribers a very happy and safe Christmas and New Year and enjoyable holidays on Phillip Island over the summer. Bimbadeen is a 340 acre working farm breeding Black Angus cattle. Visitors can take a farm tour, partake of a “paddock to plate” barbeque, or stay in one of the retreat cabins for a private getaway. As well as cattle, there are 1,500 Isa Brown hens laying hundreds of beautiful free range eggs every day. Help pick and grade the eggs – and they can be purchased at the on-farm shop/café. 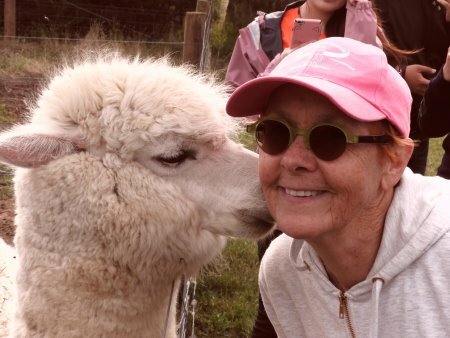 Take the opportunity to feed farm animals such as pigs, sheep and alpacas. Climb up the stack of giant round hay bales for a photo opportunity and drive to the top of Hurricane Hill for fantastic views of Phillip Island. Plus there is lots of wildlife including swamp wallabies, and birdlife such as Cape Barren geese, purple hens and ducks. Cape Kitchen must be the best located restaurant on Phillip Island. Diners have 180 degrees views over Bass Strait with the rugged south coast in the foreground. Sometimes visitors can be surprised by the sight of seals playing in the surf. On the long drive to the restaurant visitors pass breeding grounds of the silver gull. We visit during breeding season and young birds are everywhere. Many birds are on the road and can’t fly so we need to take care. In the surrounding paddocks there are also Cape Barren geese and purple hens. We have made a reservation for Sunday breakfast but Cape Kitchen is also open for lunch. The restaurant prides itself on using local and seasonal produce, such as our breakfast eggs which are from Bimbadeen farm at Ventnor. 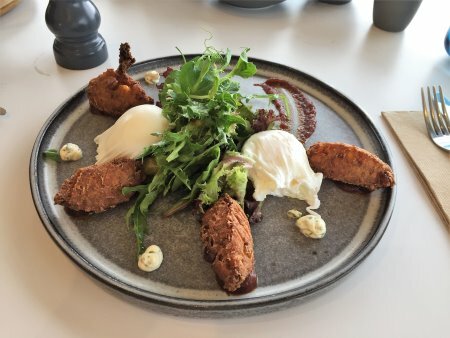 I order the Cape Kitchen Corn Cakes with avocado and mango salsa, rocket, coriander and lime sour cream, tomato chilli jam, and poached egg. This option, as well as some others, is gluten free. Apart from being delicious, the plate is beautifully presented. We linger sipping our tea, hoping to spot a seal! In winter it would be possible to see whales during the annual migration. Apart from breakfast and lunch, Cape Kitchen may open during summer for pop up dinners. Cape Kitchen is on Phillip Island Road, Newhaven, near the airport. With summer comes the breeding season of the endangered Hooded plover. The hooded plover nests on the shore among tidal debris so nests are very hard to see. 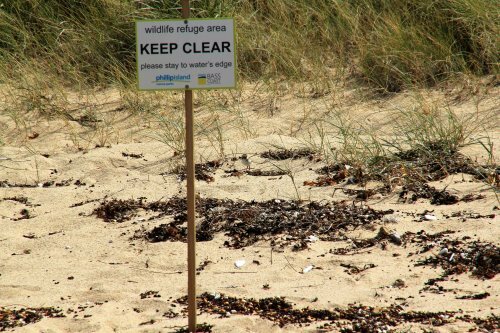 When walking along the beach in breeding areas, please keep to the water’s edge. Refrain from walking dogs where there is wildlife refuge signage. Dogs must be on a leash on all Phillip Island beaches except at Ventnor which is off leash. Sometimes seals, especially juveniles, may rest on Phillip Island’s beaches. Maintain a distance of at least 30 metres and do not approach or attempt to move the seal to the water. During early morning and dusk, swamp wallabies come out to graze. At these times keep an eye out for them along the roadside as they might jump across in front of cars. Cape Barren geese are in huge numbers on the island at the moment. They often graze right at the roadside, close to traffic so take care and slow down. If you take any of the hikes around Phillip Island, stay on the tracks. Don’t go off the path where there are nesting areas for shearwaters or penguins. Apart from destroying habitat you can injure yourself by stepping onto fragile burrows. Please observe speed limits and wildlife warning signs on Phillip Island.